his represents 5.6% of Argentina’s electricity production, generated by the Atucha I and Atucha II nuclear reactors. When the Embalse power plant comes back to full production in mid-2018, the three reactors will generate approximately 9% of the country’s electricity. The Embalse reactor is currently off-line for refurbishment so that it can operate for another 30 years at a 6% higher power output. The Embalse reactor also produces about one third of the world’s Cobalt-60 isotope requirements, principally for diagnostic medicine. The growing nuclear power output will increase yellowcake demand in Argentina from approximately 310,000 pounds per year to 650,000 pounds per year. Annual production from the Laguna Salada Deposit would start at one million pounds in year one and would average approximately 600,000 pounds of U3O8 per year over a ten-year mine life, according to the mining schedule modeled in the preliminary economic assessment (“PEA”)1. 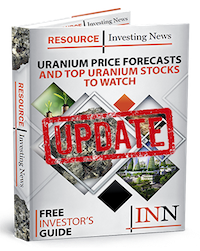 The latest publicly available data show that Argentina, which currently imports its entire uranium requirement, paid an average price of US$78 per pound in 2015. The estimated cash cost of production defined in the PEA on Laguna Salada starts at US$11.66 per pound of uranium in year one and averages US$21.62 per pound over the planned ten-year mine-life.